Bringing street smarts to TV anchor desks and an anchorman’s poise to reporting on the streets, John Henning was a stately presence in Boston broadcasting for more than four decades. Mr. Henning, who won many awards for his work and was a member of the Massachusetts Broadcasters Hall of Fame, died late Wednesday at Massachusetts General Hospital in Boston, a few months after being diagnosed with myelodysplastic syndrome, a precursor to leukemia. He was 73 and lived in Boston. Anchoring the news on channels 4, 5, and 7 for a total of 25 years, he was a no-nonsense Walter Cronkite figure for Boston viewers during a period when TV news became increasingly glitzy, a trend he abhorred. Michael S. Dukakis recalled that when he was governor, politicians took note if Mr. Henning was among a crowd of reporters, and he was easy to spot. With lengthy experience informing his reporting, Mr. Henning was known as a formidable interviewer. Also, by virtue of his physique alone, he towered over the competition and his on-air colleagues. At 6-feet-5, he delivered the news from chairs that were adjusted lower to mitigate the height difference between him and others at the anchor desk. Mr. Henning’s tenure stretched from the days when only a few channels were available, through the proliferation of cable programming and into the Internet age. In his years as an anchor, TV station owners began to rely more heavily on consultants as news became another piece of programming to sell. Mr. Henning, meanwhile, insisted that news delivered on the air could be only part of the picture. Born in New York City, Mr. Henning was the oldest of six brothers and grew up in the boroughs of Brooklyn and Queens. His father, Walter, was a city police detective and assistant chief inspector in charge of detectives. Mr. Henning worked part-time for newspapers in New Jersey and the New York City suburbs on Long Island while he attended St. Peter’s College in Jersey City, N.J., from which he graduated. He moved north to get a master’s at Boston University, where, through mutual friends, he met Betsy Cohen, an undergraduate. They married in 1969. She died in April 2008. While completing his graduate degree, Mr. Henning started working as an intern at WGBH-TV, Channel 2. In 1964, he took a reporting job at what was then WNAC-TV, Channel 7, and became an anchor two years later. In 1968, he left for WHDH-TV, Channel 5, where he was the anchor for the last news broadcast under those call letters and for the first when the station became WCVB. Eleven years later, he jumped back to Channel 7 (now WHDH), where he stayed until resigning in 1981, when his duties were diminished as station management tried to address low ratings. 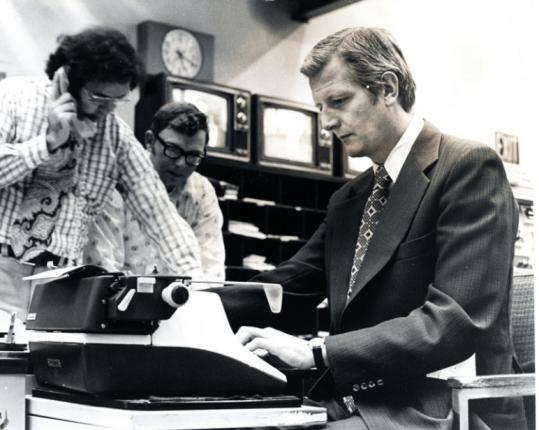 Mr. Henning completed the cycle of Boston TV news anchoring when he joined WBZ-TV, Channel 4, in January 1982, and he remained at the station as senior correspondent until 2003. In 1995, he received the Governor’s Award for excellence in news reporting at the annual New England Emmy Awards ceremony. Five years ago, he joined Denterlein Worldwide public affairs in Boston as a senior adviser, consulting with clients on public policy, media relations, and crisis management. A funeral Mass will be said for Mr. Henning at 3 p.m. Tuesday in St. Joseph Church, 68 William Cardinal O’Connell Way, Boston. In addition to his brother Peter, Mr. Henning leaves two sons, Matthew of Winchester and Gregory of Boston; four other brothers, James of New York City, Michael of Charleston, S.C., Daniel of Jacksonville, Fla., and Paul of Glen Cove, N.Y.; and three grandchildren.